My brother declares that I am the mortal enemy of the whole generation of ducks, and I declare that I love every bit of meat from this fowl. 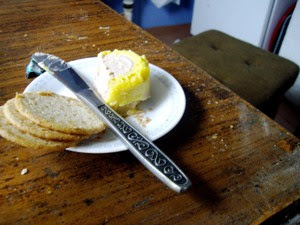 I am particularly happy to get a slice of its liver, natural or made into a paté. This dinky little tin of délice was bought in Barcelona and I was determined to bring it with me this weekend and enjoy it with a chilled glass of Sauternes wine. And I did!! Produced by Godard in the small town of Gourdon in the département de Lot in South Western France it is not entirely the real thing. It contains 25% of the stuff, besides pork meat, duck fat, eggs, milk, salt, Armagnac, port spices and sugar. 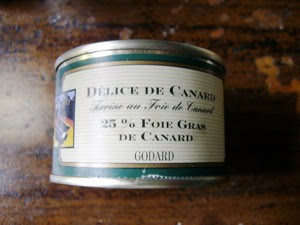 I paid €5, so I did not expect the full duck liver experience, but the little tin of délice de canard tasted remarkable well, and were enjoyed with some salted biscuits, and a bottle of the sweetest of nectars - Sauternes. Château Gravas 2003 - quack, quack!!! Château Gravas is located in Haut Barsac, has been owned by the Bernard family for 5 generation, since 1830. 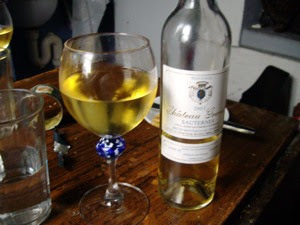 This wonderful wine is a blend of Sémillon (80%) and Sauvignon Blanc (20%). Château Gravas is truly a wonderful wine with golden colour with pleasant aromas of fruits and apples - a rich and sweet wine and perfect as company for blue cheese, foi gras or to a dessert. We enjoyed this nectar with the delice and both I and my company, Ketil Zahl, agreed that this is the way to prepare for a good dinner in the countryside. Mmmmm, I have just had the same here in Trondheim! I got a nice shipment from a friend in France - a huge lump of liver and a bottle of Chateau de Ségur from 2003, including a Petit Pont-l'Evêque and a small jar of organically produced "rips" and vanilla jam. We planned to save it, but all was gone in a matter of days.